1 This report is extracted from the Summary report on the Meeting of the Eastern Mediterranean Regional Technical Advisory Group (RTAG) on Immunization, Muscat, Oman, 14 December 2017 (http://applications.emro.who.int/docs/IC_Meet_Rep_2018_EN_17034.pdf?ua=1). In May 2012, the Sixty-fifth World Health Assembly endorsed the Global Vaccine Action Plan (GVAP) in resolution WHA65.17 (1) as the operational framework for implementation of the Decade of Vaccines 2011–2020 (1). An Eastern Mediterranean vaccine action plan 2016–2020 was subsequently developed and endorsed in October 2015 by the 62nd Regional Committee for the Eastern Mediterranean in resolution EM/RC62/R.1 (2) as a framework for implementation of GVAP in Member States of the Region. The regional vaccine action plan defines strategic objectives and priority actions for immunization programmes from 2016 to 2020 and beyond (3). It takes into account the specific needs of Member States in the Region and the challenges facing these countries. To follow up on implementation of the EMVAP, the World Health Organization Regional Office for the Eastern Mediterranean (WHO/EMRO) organized the first meeting of the reconstituted Regional Technical Advisory Group (RTAG) on Immunization in Muscat, Oman, 14 December 2017 (4). The meeting was attended by 10 of the 12 members of the RTAG, as well as staff from WHO/EMRO, WHO headquarters, UNICEF headquarters and regional offices, the GAVI Secretariat, and the Centers for Disease Control and Prevention (CDC). 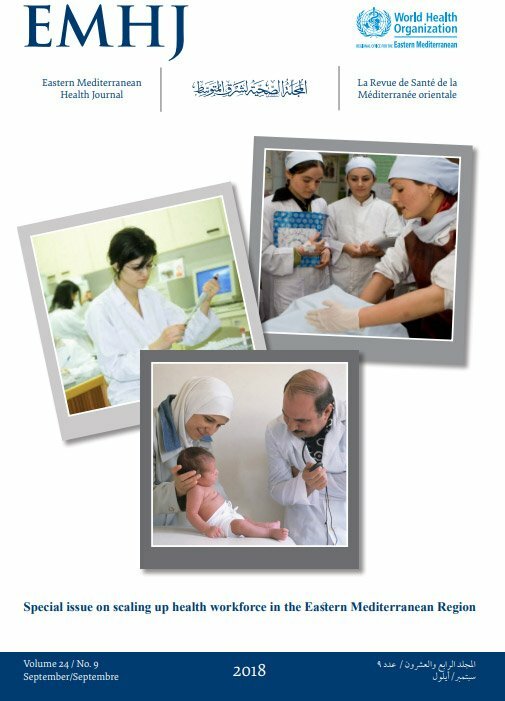 review regional progress, challenges and constraints facing the achievement of the goals of the Eastern Mediterranean Vaccine Action Plan (EMVAP) and provide advice on the way forward. Dr Rana Hajjeh, Director, Department of Communicable Diseases Prevention and Control, WHO/EMRO, in her opening remarks, welcomed members of the RTAG and thanked them for their willingness to support immunization programmes in the Region through their membership of RTAG. Dr Ziad Memish, Director of the Research Department, Prince Mohammed Bin Abdulaziz Hospital, Riyadh, Saudi Arabia, was appointed as Chairman of RTAG. The RTAG felt that the current structure of WHO’s regional vaccine-preventable diseases and immunization (VPI) programme is adequate, but that staff numbers are insufficient to cover the various areas of work and the increasing demand by countries for technical support (in particular those facing acute and or protracted emergencies). Exploring other mechanisms to increase human resource capacity at WHO such as the use of fellowship programmes, junior professional officers and secondments is needed. Routine immunization coverage in the Region shows continued success in 14 out of the 22 countries. However, achieving the EMVAP coverage target remains a challenge in other countries, particularly those facing various degrees of humanitarian emergency. The large number of unvaccinated children in the Region is of great concern. There is a need to map who and where they are, and why they are not reached. A strategic plan for countries with a high number of unvaccinated children, based on the mapping exercise and adopting a focused approach, is required, along with the allocation of the necessary funds. There is a need to raise the visibility of measles in order to increase political commitment. Countries need to assess population immunity, predict and early detect outbreaks, and address immunity gaps to mitigate outbreaks, such as applying cohort analyses and reviving and using the measles strategic planning tool. Rubella vaccination should be introduced more widely in the Region, where suitable, and the opportunity of measles elimination used to eliminate rubella as well. There is a need to address the introduction of new vaccines according to their respective disease burden. Accordingly, pneumococcal conjugate vaccine (PCV) should come first, followed by rotavirus vaccine, then human papillomavirus (HPV) vaccine. National Immunization Technical Advisory Groups (NITAG) will need to be well informed in order to take the appropriate decision on this for each country. The polio transition process involves careful analysis of the risks and opportunities associated with ramping down or transitioning the assets, functions and knowledge of the polio programme at all levels. Four countries in the Region are considered priority: Afghanistan, Pakistan, Somalia and Sudan. The Regional Steering Committee on Polio Transition decided in 2017 to add Iraq, Syrian Arab Republic and Yemen to the list of priority transition countries in the Region due to ongoing conflicts causing refugee migrations and internally displaced persons. The Global Polio Eradication Initiative (GPEI) will begin to be phased out 6–12 months after certification of interruption of wild poliovirus transmission, impacting the size and availability of polio assets. There is concern about the development of this change, especially in the field. Afghanistan and Pakistan will not be affected by polio transition in the immediate future, as they remain endemic for polio. Huge resources were invested in polio eradication and there is concern about the loss of polio infrastructure. Resources need to be mobilized to maintain and adapt this infrastructure for the elimination/eradication of other diseases (such as measles), and to sustain the eradication of polio. The RTAG noted the following achievements in the Region with appreciation. The maintenance of high coverage for all antigens provided by national immunization programmes in 14 countries of the Region (Bahrain, Egypt, Islamic Republic of Iran, Jordan, Kuwait, Libya, Morocco, Oman, Palestine, Qatar, Saudi Arabia, Sudan, Tunisia and United Arab Emirates). However, there are concerns about the quality of immunization data and the validity of coverage estimates for Libya. The maintenance of immunization programme functions under extremely challenging situations, including active conflict, in some areas in countries experiencing humanitarian emergencies (Iraq, Libya, Syrian Arab Republic and Yemen). The Region has gained much experience and developed best practices in delivering immunization in areas of armed conflict and in the various phases and types of humanitarian crisis. The remarkable progress made towards polio eradication in the Region, particularly in Afghanistan and Pakistan, the two remaining endemic countries, and the commencing of planning for polio transition in the Region. Revise the terms of reference of the RTAG to include addressing vaccine-preventable diseases control and immunization during acute and protracted humanitarian emergency situations. Establish a RTAG website with an interactive component open for questions and answers. Include the engagement of NITAGs as an agenda item at the next RTAG meeting. Establish RTAG working groups on the following: meeting EMVAP immunization coverage targets; conflicts and complex emergency situations; and new vaccines introduction. WHO should develop a comprehensive advocacy and resource mobilization strategy for implementation of EMVAP-related activities. WHO should develop a business case to demonstrate the vaccine-preventable diseases burden in terms of morbidity and mortality, the economic benefits of achieving EMVAP goals, and the cost of implementing the related activities. RTAG should utilize any opportunity with governments and partners to raise the visibility of EMVAP goals and promote commitment. WHO should take immediate action to work with countries and partners to map the unvaccinated children in each country to identify who and where they are, and why they are not being reached. WHO should develop a concrete strategic plan for countries with a high number of unvaccinated children to reach the unreached. It should adopt a focused approach and include the allocation of the required funds. If possible, WHO should support Pakistan in forming and leading a multi-partner taskforce, learning from the polio experience, and focusing on addressing the gaps in routine immunization. WHO should maintain the measles elimination target of 2020 and verify elimination in countries that meet the criteria for verification. WHO should establish progress milestones on the path to elimination for countries facing high endemicity/outbreaks of measles. By 2020, attain at least 90% measles-containing vaccine first-dose (MCV1) immunization coverage in Djibouti, Pakistan, Sudan, and Syrian Arab Republic; and at least 80% MCV1 coverage in Afghanistan, Somalia and Yemen. Bahrain, Jordan, Oman and Palestine are to submit for measles (and rubella, if applicable) elimination verification at the earliest opportunity and no later than end 2018. Egypt, Kuwait, Islamic Republic of Iran, Libya, Morocco, Saudi Arabia and Tunisia should begin preparation of documentation for verification of measles (and rubella, if applicable) elimination, completing the documentation by 2019. Countries that have not yet introduced rubella-containing vaccine (RCV) and potentially meet the criteria for introduction (Afghanistan, Djibouti, Pakistan and Sudan), should introduce RCV into their national programmes by 2020.
WHO should identify mechanisms and responsible focal points for coordination between the VPI programme and the GPEI, and provide clear milestones for monitoring progress. WHO should systematically identify and leverage synergies between the immunization programme and ongoing polio eradication activities before the commencement of polio transition. Countries that have not yet done so, should add the following new vaccines to their immunization programme schedule in order of priority as determined by NITAG: pneumococcal conjugate vaccine, rotavirus vaccine, chicken pox vaccine, hepatitis A vaccine, and human papillomavirus vaccine. Countries where hepatitis B immunization has not been implemented at birth, should take the necessary steps to introduce this as soon as is feasible. Countries that have not introduced HPV vaccination should initiate efforts to quantify the HPV-related burden of disease, enhance advocacy for HPV vaccination, and raise public and physician awareness and education. Countries should plan to establish an adolescent vaccination platform where this is absent. This is necessary for implementation of the pre-teenage tetanus/diphtheria/pertussis booster and the introduction of HPV vaccine. Sixty-fifth World Health Assembly. Global vaccine action plan. Geneva: World Health Organization; 2012 (http://apps.who.int/gb/ebwha/pdf_files/WHA65/A65_R17-en.pdf). World Health Organization Regional Office for the Eastern Mediterranean (WHO/EMRO). Annual report of the regional director for 2014. Cairo: WHO/EMRO; 2015 (http://applications.emro.who.int/docs/RC62_Resolutions_2015_R1_16570_EN.pdf). World Health Organization Regional Office for the Eastern Mediterranean (WHO/EMRO). Eastern Mediterranean vaccine action plan. Cairo: WHO/EMRO; 2017 (http://www.emro.who.int/vpi/vpi-infocus/eastern-mediterranean-vaccine-action-plan.html). WHO Regional Office for the Eastern Mediterranean (WHO/EMRO). Meeting of the Eastern Mediterranean Regional Technical Advisory Group (RTAG) on Immunization, Muscat, Oman, 14 December 2017 (http://applications.emro.who.int/docs/IC_Meet_Rep_2018_EN_17034.pdf?ua=1).